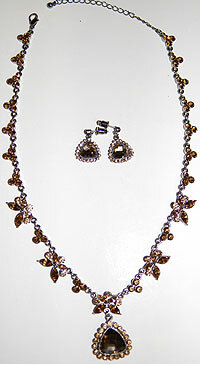 Topaz and Chocolate Necklace and Earrings Set. Necklace is adjustable from 16 to 19 inches and has lobster claw clasp. Matching pierced earrings in beautiful topaz and chocolate color stones. Stones are made of glass.